At once a supernatural delight and a coming of age story, The Graveyard Book: Volume 2 The Graphic Novel by Neil Gaiman and P. Craig Russell was a joy to read and savor. Volume 2 picks up right where Volume 1 leaves off. 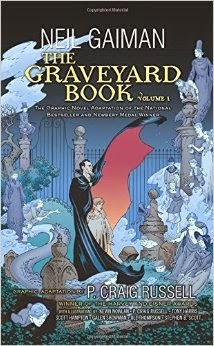 (If you have not read The Graveyard Book or Part 1 of the graphic novel, I highly suggest you do before reading this book.) Bod, now a school aged young man, is still living in the graveyard under the watchful eyes of the ghosts and his enigmatic protector, Silas. As he gets older, Bod realizes that he is different from the other creatures in the graveyard. He is alive, while they are not. It is this life within him that compels him to want to see the world—and as a first step, to go to school. Of course, he is shrouded a bit to make him less memorable to the other students, but Bod finds new freedom and purpose at school. When he encounters bullies, he uses his special talents to make them see the error of their ways. In a later chapter, Bod comes face to face with his past and the man who killed his family. He is reunited with an old friend, who unknowingly brings the danger straight to Bod. With his intelligence and skill, Bod is able to avert the danger and save his friend. Volume 2 ends with a bittersweet parting of Bod and the residents of the graveyard. He is all grown up and must find his place in the world. I found myself a little sad that he needed to go out on his own. And, surprisingly (since graphic novels are really not my thing), I was wishing that there was a Volume 3 to look forward to. As I did after reading Volume 1, I must caution that this book is a bit too dark for younger readers, but older more mature readers would love it I am sure. I loved the art and the story flowed quickly and beautifully. 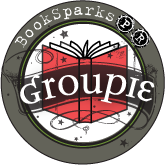 The themes of growing up, learning who you are, and letting go were especially poignant in this novel. I loved it even more than I loved Volume 1. Beautiful, touching, and amazing artwork makes this book one not to be missed.